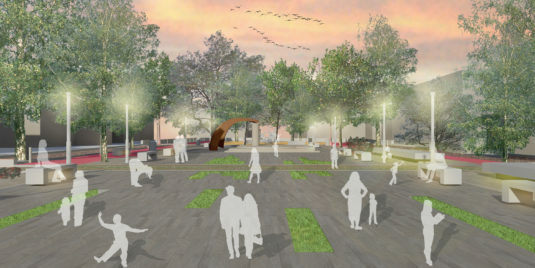 The mayor and the governor of Pomezia have approved the preliminary draft for the upgrade of the public garden and Piazza Italia in Torvaianica. NOS Design has been commissioned for this intervention, which involves a complete renovation of the park: a new entrance and flooring, urban furnishings, plantations, lighting and video surveillance, and the development of the children’s play area. The work, worth approximately 548.000 euros and subsidized by municipal funds, will be public tender from next September. Work should therefore be started at the beginning of 2018. This intervention is in addition to the other works of the upgrading of Torvaianica: the new furnishings in the Piazza Ungheria and the Belvedere, the dismantling of the very old building and the reconstruction of the former beach resort New Las Vegas Beach, the new illumination of the facade of the Church that will be ready in August and the replacement of the Belvedere balustrade that will start in September. NOS Design is honored and excited to be involved with the revitalization of this area and looks forward to the further growth of the community as a result.